How in the world did we win that one? For long patches, the only consolation was that the satellite feed from Yangon was so bad we did not have to see how poorly the Philippines were playing. In fact, it took a timely interview at halftime with team manager Dan Palami to put the performance in perspective. Palami quite correctly gave everyone the friendly reminder that there was a reasonable amount of ordnance missing from the armoury either because players were not released by the clubs or are still recovering from injuries. Add to this the fact that the returning Manny Ott – a natural midfielder – was playing in the unfamiliar role of rightback along with the obvious preseason form of almost the entire team and to get to half time with the match still goalless was quite a creditable achievement. Because Myanmar by their own profligacy or Etheridge’s brilliance could not score the goal that all their intricate possession deserved, they were also unwittingly setting themselves up to be robbed at the other end. This brings us to the first reason why we won the match. Myanmar’s players had learned their football well. They pressed high, were comfortable on the ball and played neat little exchanges with each other all over the pitch. But they could not hit a parked bus with a rock from ten metres if they tried. Partly, this was because of the second reason why we won the match. 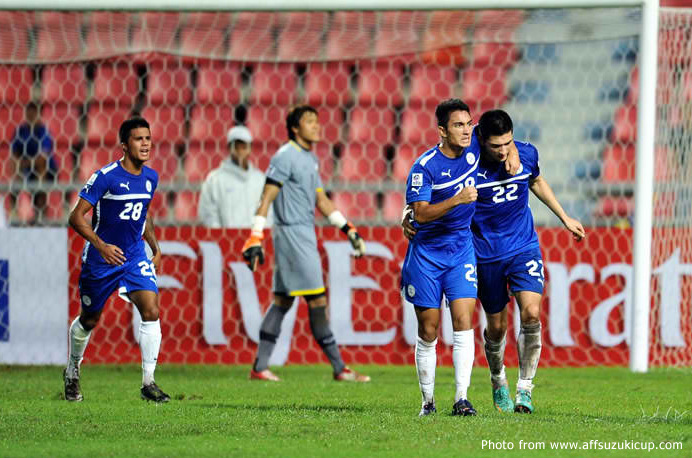 In the 12th minute, a deep Myanmar cross eluded the entire Philippines defence to set up a clear shot at goal. The mere sight of Neil Etheridge – all 6 foot 3 inches of him along with the bonus of an EPL club reputation – was enough to put off the strike, which sailed harmlessly wide and over. Etheridge had crossed the continental divide to get some much-needed match exposure. He got exactly what he came for and showed everyone watching that, while Eduardo Sacapaño deserved all the plaudits for his Suzuki Cup heroics, the space between the posts is still very much Etheridge real estate when he is available. Twice in the second half, Etheridge’s goalkeeping was the sort that if Martin Jol was watching, he would seriously be thinking of giving Mark Schwarzer good reason to ponder retirement. In the 57th minute, after Myanmar had carved open the Philippines defence with a low cross from the left flank, Etheridge stuck out a foot in a reflex move to deny a certain goal from almost point-blank range. The Fulham stopper came to his country’s rescue again in the 73rd minute after a Myanmar player was allowed to waltz through the Philippines defence and drive a powerful shot on target from a decent angle. Etheridge dove to parry the ball away to safety. So on to the third reason why the Philippines won the match, a diminutive busybody of a player from the eastern shores of America who scored his second international goal at the ripe old age of… 18! OJ Porteria and Phil Younghusband looked in the first half like prom dates who had regrettably not been introduced until the event. The youngster was as ever a bundle of energy and showed trickery with his feet; except that he has more milk to drink before he learns how to use these to his and his team’s benefit. Younghusband looked a forlorn figure upfront. There will be those who will question the wisdom of taking out Chieffy Caligdong in the second and pulling down Porteria to play on the left flank. Michael Weiss, one suspects, must have a crystal ball hidden somewhere. Indeed, it was Porteria who won the match for the country with a finely taken goal in the 77th minute. The chance was set up by Ian Araneta, Philippine football’s forgotten man who for once gave a decent cameo that will keep the acid-tongued critics at bay. Receiving the ball in midfield, Araneta found Porteria unmarked on the left flank with an intelligent change of play. Porteria took on his defender, slipped him with a drop of the shoulder and let loose a low shot that pierced the back of the net. 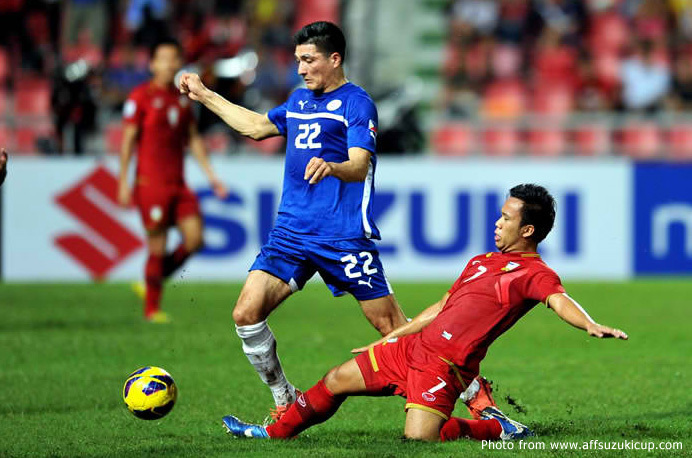 Myanmar wilted after the goal and the Philippines started to take a firm hold on the match. In fact, Porteria could have earned himself a brace late in the match only to shoot wide. Seen in perspective, while the Philippines performance was probably not one for the how-to training videos, it showed the type of resilience that allows teams of pedigree to conjure victories out of scrappy affairs and non-vintage performances. Not only was this the first international match coming off the holiday season, there was also a significant number of players not available. The 1-nil result may ultimately be unconvincing; but it is something to build on.